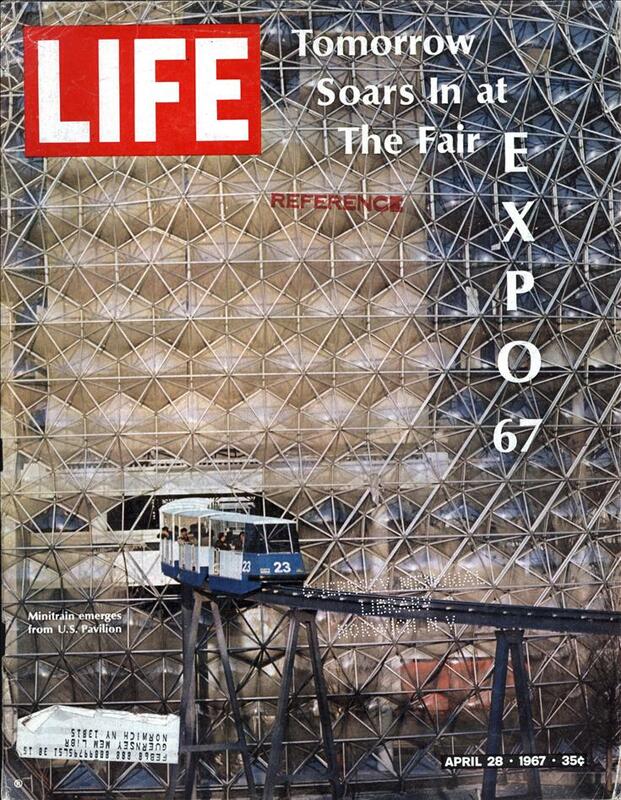 A new world of flight will begin in 1969. And Pan Am will begin it. Yesterday, they were no more than dreams on a drawing board. Today, they’re on their way to reality. And the reality will be a new world of almost unbelievable speed and size, comfort and quiet. Conjure up an image of some triumphant ocean liner suddenly sailing the skies—and you have our 747. Imagine a plane that makes it practical for you to take a business trip from New York to London and back in the same day —and you have our SSTs. Now you know why we can’t wait to get these planes off the ground. They are the next generation of great aircraft. And making great aircraft come true has been our way of life ever since the 1920s. Remember our China Clipper and our B-314 Flying Boats? Our B-377 Stratocruisers? Our 707 and DC-8 Jet Clippers were tremendous breakthroughs—and we’ve been in on many others. And look what’s coming. Take the Pan Am 747, for instance. Approximately two-thirds the length of a football field, it will make today’s four-engine Jets look like baby brothers. The 747 will be 76 feet longer, 10 percent faster, twice as powerful. It will need almost 2,000 feet less runway on takeoff. And when the day comes that you enter this elegant giant, you’ll rule out the word cabin. The interior will simply be too spacious for so small a word. And comfort will reign supreme. Our First-Class President Special section will consist of a lower deck with an honest-to-goodness bar and a spiral staircase leading to an upper deck. Our Rainbow Economy section will give you extra-wide seats for curling up, two extra-wide aisles for strolling about. Surprisingly enough, the 747 will also be less expensive to operate. This will enable us to press for even lower fares than we have right now. 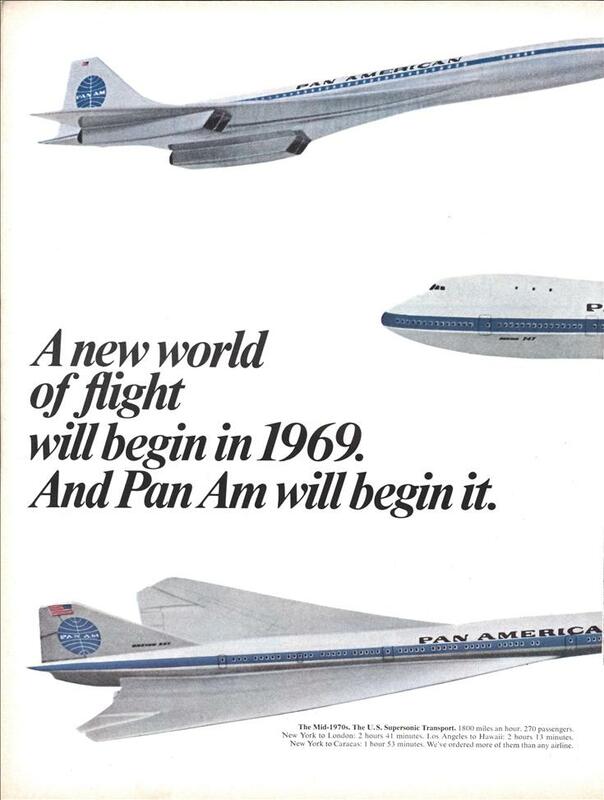 And that will only be fitting, for without Pan Am’s participation, there wouldn’t be any 747s at all. These, then, are the planes of tomorrow. We’ll have more of them for you than any other airline. And they’re all just over the horizon. One out of three they actually got. And then they went bankrupt. And now they’re a prime time soap opera. I remember flying Pan Am in the 70’s. There was no more rude, more uncaring (except for themselves), more uselsss employees in the industry. TWA was a close second. I remember sitting on one of those 747’s on the tarmac in Frankfort for 6 hours without food or water while the union steward “negotiated” with the airline for extra pay before the cabin crew would serve beverages to the passengers held hostage. They were real pioneers in commercial aviation. Besides all the firsts listed in the ad, they were also first with worldwide computerized reservations. My wife worked for them for 15 years through the late fifties and all of the sixties. She wore the same uniform that those gals in the new series wore, and, I might say, looked at least as good as any of them and still does. And we still have a couple of those flight bags with the PanAm logo in mint condition. We flew all over the world on those jets of theirs on her employee discount and, although I didn’t much like the first TV episode and won’t watch any more of them, seeing all those Pan Am planes, terminals and uniforms actually brought a tear to our eyes. What a great airline it was! They actually ordered the American SST? I had the impression that buyers couldn’t be had? Michael C: 26 airlines had orders for 122 SSTs. Then the House of Representatives pulled the funding, before any of the prototypes was made. Does the 13 Coins Restaurant still serrve the SST sandwich err does the 13 Coins Restaurant still exist? As a hippy we used to get stoned and pretend to wait to get a table watching all the suits giving us dirty looks – like dogs watching an executive toy. The SST was all we could ever afford and it was heaven (I’m told it was heaven even when you weren’t stoned). RIP Gil, Toland, Paula, Randy. Why oh why didn’t I but a bit of the wing of the SST prototype it would be worth so little today I think the lazy B started off wrong making it of wrought iron. Sorry Joe but it doesn’t look as if the SST sandwich is still on the menu.